Sit in on an open Fredonia Faculty Jazz Trio rehearsal with Nick Weiser, piano, Kieran Hanlon, double bass, and John Bacon, drums. 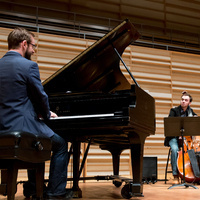 The trio will illustrate different strategies for workshopping familiar jazz standards, known music, and new material. Join us!